Regardless of where you are on your parenting journey, SHAPE: The 5 Keys to Parenting from Research and Real Life, is a life-changing book that will lead you and your children down a more peaceful, productive path. From the very first chapter to the book’s last page, SHAPE translates powerful parenting principles into relatable ideas and ready-to-implement strategies to strengthen your parent-child relationship and fuel your child’s success at home, at school, and in other areas of life. Blending Paula’s good and bad experiences as a mom with her background as an educator and child development specialist, this book empowers parents to lead their families with connection and clarity, and empowers children to lead themselves with confidence, no matter how troubled or how tranquil their lives may be. 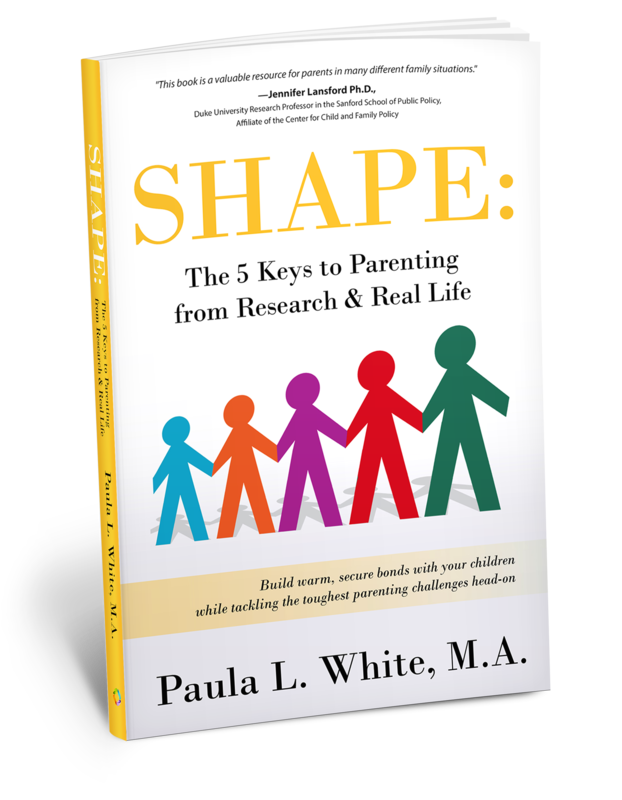 Praise for SHAPE: The 5 Keys to Parenting from Research and Real Life. “SHAPE is filled with practical suggestions to help parents structure their home lives and build positive relationships with their children. Grounded in the fields of child development and family studies, this book is a valuable resource for parents in many different family situations.” Jennifer Lansford, Ph.D. | Duke Research Professor in the Sanford School of Public Policy, an affiliate of the Center for Child & Family Policy. “SHAPE demystifies parenthood to improve children’s wellbeing.” Cheryl Walker, MSW. | Family therapist and parent educator.